According to the American Academy of Pediatrics, children should travel in a rear-facing care seat until at least 2 years of age. Keep your child rear-facing as long as possible. It's the best way to keep him or her safe. There are different types of rear-facing car seats; infant-only seats can only be used rear-facing. Convertible and three-in-one car seats typically have higher height and weight limits for the rear-facing position, allowing you to keep your child rear-facing for a longer period of time. Your child should remain in a rear-facing car seat until he or she reaches the top height or weight limit allowed by your car seat's manufacturer. Once your child outgrows the rear-facing car seat, he or she is ready to travel in a forward-facing car seat with a harness. 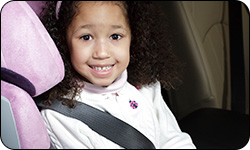 By following these guidelines, your child will ride as safely as possible, and you will be establishing the foundation for a life-long habit of seat belt use every time your child travels. Keep your child in a forward-facing car seat with a harness until he or she reaches the top height or weight limit allowed by your car seat's manufacturer. Once your child outgrows the forward-facing car seat with a harness, it's time to use a booster seat that is located in the back seat. Keep your child in a booster seat until he or she is big enough that the seat belt fits properly. The lap belt must lie snugly across the upper thighs, not the stomach. The shoulder belt should lie snug across the shoulder and chest and not cross the neck or face. Remember, your child should continue to ride in the back seat because it is safer there. When your child outgrows a booster seat, and can fit properly into an adult seat belt, it is important that families make it a priority to remind everyone in the vehicle to buckle up every ride, every time. Be sure all occupants wear safety belts correctly every time. Children learn from adult role models.